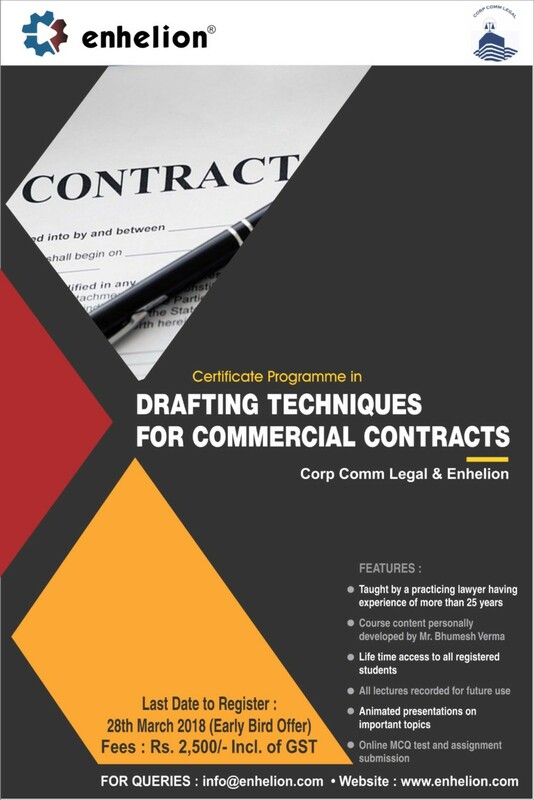 Corp Comm Legal’s founding partner – Mr Bhumesh Verma in association with Enhelion, has launched a three-month – self-paced – online certificate course on Drafting Commercial Contracts. Drafting of commercial contracts is a craft and many law students and young legal professionals, find it really hard to draft top class commercial contracts. The reason is, they are not aware of the techniques and the language involved in drafting such legal agreements. With the response that Enhelion and Corp Comm Legal received for the short 2 day continuing legal education programme on Commercial Contract drafting and with countless requests from the student audience to launch a longer programme on Commercial Contract Drafting, we bring forth this unique certificate programme on Drafting Techniques on Commercial Contracts. Drafting legal documents, especially commercial contracts, is no easy task. Although on the face of it, they may seem to be simple and quick to draft, but ask any lawyer who drafts contracts for his bread and butter, it is a gigantic task to put everything in writing and place it before her/his client for her/his approval. It also requires skills and techniques to bring out a good contract that is worded appropriately and protects the client’s interests. As Ken Adams, an authority on Contract Drafting puts it, “For effective contract drafting, you need quality raw materials—the building blocks have to be clear, concise, and consistent, and they have to make sense. The craft in contract drafting shouldn’t reside in coming up with the raw materials. Instead, it lies in one’s command of the raw materials and applying them to achieve an end”. In this online course, the learner shall not only how to draft commercial contracts, but will also learn the tricks and techniques that need to be applied in today’s age. What information do you require to start drafting? What are soft skills required for drafting a contract? Difference between MOU and Agreement? Duration: 3 Three Months – Self Paced Courses [You can start anytime and end anytime. But we recommend that you complete it in three months]. Content: Access to content, which includes online lectures, animated videos and written course material is for “life”. Start Date: You can start anytime and end anytime. It is up to you. For any queries: please email [email protected].